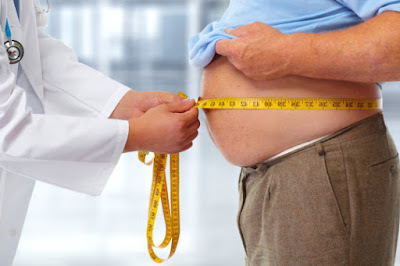 People are generally considered obese when their body mass index (BMI),a measurement obtained by dividing a person's weight by the square of the person's height,is over 30kg/m square with the range 25-30kg/m squared defined as overweight. Obesity is defined by body mass index (BMI) and further evaluated in terms of fat distribution via hip ratio and total cardiovascular risk factors. Obesity is mostly caused by a combination of excess food intake and personal choices. At an individual level,a combination of excessive food energy intake and a lack of physical activity is thought to explain most cases of obesity.A limited number of cases are due primarily to genetics,medical reasons,psychiatric illness.In contrast,increasing rate of obesity at a societal level are felt to be due to an easily accessible and palatable diet,uncreased reliance on cars,and mechanized manufacturingdenseje widespread availability of nutritional guidelines has done little to address the problem of overeating and poor dietary choices. Most of the extra food energy coke from an increase in carbohydrate consumption rather than fat consumption. The primary sources of these extra carbohydrate are sweetened beverages,which now accounts for almost 25% of daily food energy in young adults of today. Consumption of sweetened drinks such as soft drinks,fruit drinks,iced tea,and energy and vitamin water drinks is believed to be contributing to the rising rate of obesity and an increased risk of metabolic syndromes and type 2 diabetes.Vitamin D deficiency is related to diseases associated with obesity. The association between fast food consumption and obesity becomes more concerning daily. Obesity is mostly preventable through a combination of social changes and personal choices, changes to diet and exercising are the main treatment.Diet quality can be improved by reducing the consumption of energy dense foods,such as those high in fat and sugar,and by increasing the intake of dietary fiber. Medications can be used along with a suitable diet to reduce appetite or decreased fat absorption. If diet,exercise and medications are not effective,a gastric balloon or surgery may be performed to reduce stomach volume or length of the intestines leading to feeling full earlier or reduced ability to absorb nutrients from food. Quote;obesity is not because it runs in the family!! !it is because no one runs in the family. Obesity is very easy to catch-they can't run very fast!